Instead of running a fundraiser this nine weeks, the middle school house of Honor wanted to run a social campaign to help the organization "R-Word: Spread the Word to End the Word." This organization works to help eliminate the R-word "retard(ed)" from being used in inappropriate ways. This social campaign asks people to pledge to stop saying the R-word as a starting point toward creating more accepting attitudes and communities for all people. Use of this word is often an issue in middle schools. The house of Honor wanted to educate NCS middle school students and ask them to commit to not use the R-word and be more aware of their language in general. They also bought wristbands in support of the campaign and handed them out to middle school students who agreed to commit to not using the word any longer. Way to go house of Honor! You truly exemplify our mission of being "a Christian, authentic, dynamic school equipping students to be global leaders." You have shown strong leadership and have taken a great step towards changing your world! 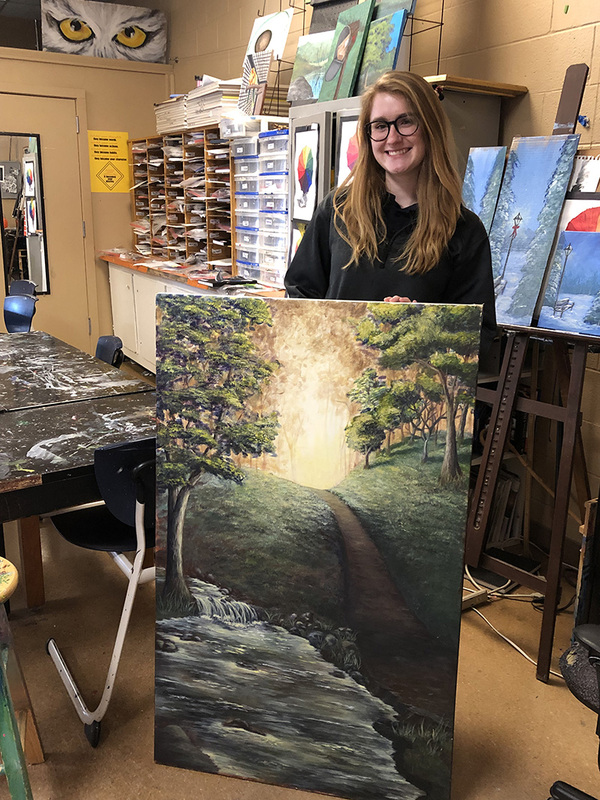 The Bel mont University Department of Art and Tennessee Art Education Association is proud to announce the 11th Annual Middle TN Regional Student Art Exhibition. This year, they received a total of 790 received student entries, only 96 were selected for the exhibition. One of those students was our very own senior, Annmarie Alexander! This year's panel of jurors included Dr. Jeremy Blair (Assistant Professor of Art Education at TN Tech’s School of Art, Craft & Design), Jianna Mirabelli (Art Educator at Inglewood Elementary School), Tom Stanford (Photography Coordinator at Nossi College of Art), and Caitlyn Henneberry (Belmont University Art Education student). They were presented with quite the challenge, selecting works to represent the Middle TN region. We are so proud of Annmarie and her incredible talent, guided under the leadership of NCS art teacher Donna Torrez. Annmarie's artwork will be on display in the through January 25th at the Leu Center for the Visual Arts located at 1900 Belmont Boulevard, Nashville, TN 37212. Congratulations Annmarie! Such beautiful work and amazing talent ... and a lovely young lady! Hopefully, we will see more from this gifted artist! Best wishes going forward! I couldn’t be more proud. You are an incredible artist!!! 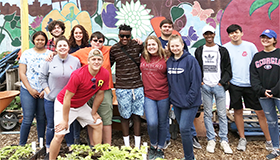 Every year, high school students from Nashville Christian School are given the opportunity to participate in a mission trip to New York City through the Center for Student Missions. This past June, a group of 22 students and teachers spent eight days embedded in the culture and diversity that New York City offers. It was truly a life-changing opportunity, and during the trip a very authentic, gut-wrenching experience took place. The group was serving in East New York at a community farm. As they were eating lunch, a discussion came up about how much we take for granted in America. One of our seniors, Mente Rudolph, began to share his experiences in Ethiopia. Mente is at Nashville Christian School because he was adopted from Ethiopia by a local family. He shared that he and his family received one meal a day in Ethiopia and that they were extremely grateful. All of the students were impacted by what Mente shared and began to brainstorm about ways to help. Student Government Vice President Tanner Goodman and National Honor Society Treasurer Sydney Cantrell challenged the group to think outside of the box. In the end, the chaperones and other mission team members made a decision to challenge the entire NCS student body to help feed children in Ethiopia. This project is designed to take the small change that we consider trivial, and use it to feed hundreds of children in Ethiopia. We collect change and small bills each Friday to contribute to this cause. It takes $250 to feed 100 children, and so far we have collected $2,103.87! Ordinary Hero sent this special thank you video which we hope brings home the impact of your donations. Nashville Christian School, Thank You From Ethiopia/Ordinary Hero from Ordinary Hero on Vimeo. We are asking each student to give one dollar every Friday through the rest of the school year. You can send in small change or donations with your student, give donations to Leslie Dahl at the front desk, or catch one of us in the traffic line. If you would like to know more about Ordinary Hero, click here. Mike Campbell, Chairman of the Board for NCS, first joined the board in 1992. He graduated from NCS with the great class of 1979. His children graduated from NCS as well, Leah (06) and Jake (09). Henry, his grandson, is also presently attending the preschool. Mike got a BS in electrical engineering from TSU and has spent his entire adult life in electrical construction. Presently, he is the vice chairman of Enterprise Solutions, LLC. We recently interviewed him about our new mission statement. Describe the process of developing a new mission statement. As NCS has grown and changed, so has our school mission statement. The former mission statement was intentionally focused on demonstrating the love of Christ. It was extremely important to the Board to embrace that Christ’s love is foundational to everything. If our students, teachers, staff, and families looked at all relationships through this lens, then it would effectively impact the focus of our campus which in turn effectively impacts our spiritual formation. As a school, we had to decide who and what is NCS. The board of directors, school administrators, and focus groups went through this period of growth and reflection together. I think the mission statement we adopted at the end of this process states exactly what we strive to be and achieve at NCS. Why was it important to include the words Christian, authentic, and dynamic? I think Christian is what NCS strives to be to our core. If we don’t start there and make that our main principle, the rest of the mission statement is almost meaningless. To me, authentic tells everyone that NCS understands who NCS is; we are proud of that, and we don’t want to be any other school. Dynamic speaks to forward movement, high energy, and effectiveness, a force that affects change. Nashville Christian always seeks to pursue excellence in every area to continuously improve and provide students with the highest quality educational experience to prepare them to be global leaders. As the school’s leadership has grown, I marvel at the talent and godly people we have leading the school. Every person works to make each student, from preschool to high school, a Christian, authentic and dynamic person, and it shows any time you step on this campus. What changes have you seen at Nashville Christian School since you have been a part of it, and how have you participated in affecting change? My brother Mark (‘78), sister Mindy (‘80) and I started at NCS when we were still in the West Nashville Heights Church of Christ building. My father was chairman of the building committee when we started the process to build a new school building. We spent a lot of weekends along with other families working on clearing the property. All the kids worked, but also had a lot of fun playing when our parents weren’t watching. I remember the groundbreaking for every major building we have and enjoy seeing the campus continue to improve. I am very excited about the possibilities of more buildings to come in the near future. I mentioned the leadership of the school earlier, and I know they are the right group to lead the school and continue to grow what is a wonderful Christian culture on our campus. If I just stay out of the way, Connie Jo Shelton and the leadership will keep making NCS exactly what our mission statement says we strive to be. Our new mission statement states that we are equipping students to be global leaders. As a graduate of NCS and business owner, how are you a global leader? Webster’s dictionary defines global as “relating to or embracing the whole of something or of a group of things.” Global leaders are not only focused on their own interests but have a genuine interest in impacting their surrounding community and society as a whole. They understand that while personal success and prosperity are important, what you do with it to help others, and the imprint you leave on the world is what makes a true leader. I think my parents and NCS instilled in me a foundation of thinking about the whole instead of myself. As a business owner, you must look at what is best for the company and the people working with you before worrying about yourself. What do you think NCS students need to become global leaders? To become a global leader, NCS students need a curiosity about the world around them and a desire to continue learning and use what they learn to affect change. By following the examples of their teachers, coaches, and the leadership at NCS, an NCS student sees and is taught what it is to think globally instead of only thinking about themselves. 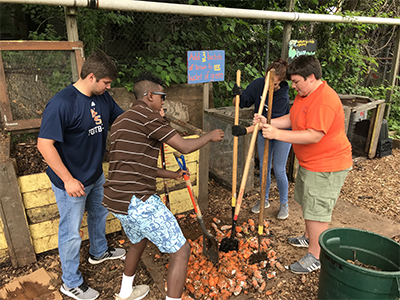 Through differentiated instruction in the classroom, multiple enrichment clubs and activities, athletic teams, the fine arts and service opportunities like Kathy Overbay Service Day and international mission trips, the NCS graduate is well equipped to be a global leader.